Turf Hacker: I got a drone! Thank you! Cheekily, I replied, "I wish" knowing that this wasn't something that I could afford, even used. The next morning I woke up to find that fellow PNW superintendent, Ryan Gordon, had started a gofundme campaign to help me get Thomas' old drone! At first I thought that no one would ever give me money to buy a drone. 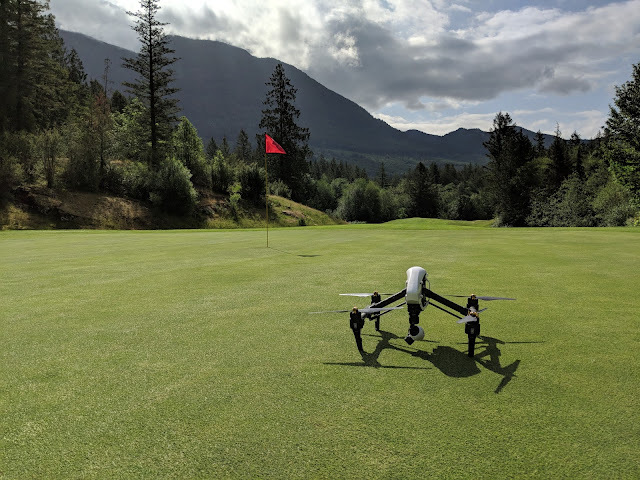 Afterall, drones are still considered by most to be a luxury item for golf course operations. To be honest I felt a bit bad to be the recipient of a fundraiser. To my surprise after a few short minutes the donations started to pour in and after about a week almost $800 had been raised to pay Thomas for his old drone. Even though the fundraising goal was $1000 Thomas was happy to receive the lower amount and sent me the drone! Thank you everyone who donated and especially Thomas and Ryan for their generosity and thoughtfulness. I have big plans of how I can use a tool like this on my golf course and plan on sharing everything on this blog. Flying a drone in Canada is very restricted. You can fly for fun in certain remote areas but if you fly for work ( which includes uploading video to youtube or a blog) you need a SFOC (Special Flight Operations Certificate). So unfortunately before I can share anything on my blog or online in any way (even likes are considered payment and would require a SFOC) I need to get a permit to fly. The fines are stiff at $30,000 so as someone with some social media attention, I am going to play it safe and do it by the book. This is an involved process but something that I have already started to achieve. I need to complete aviation ground school, get a radio operators license, file a SOP, Safety Plan and many more things before I can legally fly. I hope to have all this done and be legal to fly some time in July (waiting period after applications are 20 days - 2 months). After I file a few successful SFOC I can apply for a standing permit which will allow me much more freedom of when I can fly. This should be easy to achieve on a golf course because it is very easy for me to plan long in advance of the SFOC flights that are required to achieve more freedom. I will share this process on my blog for those that are interested. Either way, I am so grateful and humbled to be the recipient of such generosity and thoughtfulness from the turfgrass community. I can't thank everyone enough!